What tastes like cheesy chips but actually gives you your greens in a dairy free, soy free, gluten free, crunchy snack? Kale chips! Fun to make with the kids, too (messy hands-on fun). There are MANY variations of this recipe but as long as there's one red veggie (for color) and it's not too runny it still works. Need: Food processor and a Dehydrator (you can use your oven as a dehydrator if necessary). CURLY leaf kale, washed, ripped away from the big stems and torn into smallish pieces. Set aside in a very large bowl. 1 TB nutritional yeast (get at health food stores). Can skip if it upsets your system but it won't taste cheesy. 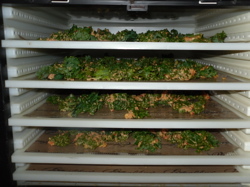 Lay out your dehydrator trays and teflex sheets NOW as your hands will too covered in kale chip coating to touch anything in a minute! 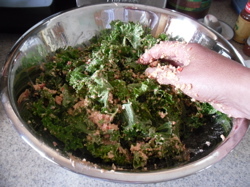 Dump the mixture from the food processor onto the kale in the bowl and massage with your hands until each piece is well coated. Lay onto the sheets and leave in the dehydrator on 105-110 degrees. Flip onto trays without teflex sheets about halfway through to speed up the process. They'll dry in about 8-10 hours, depending on how crunchy you like them and how thickly you've coated them in cheesy goodness. Sometimes mine take closer to 14 hours. Well worth the wait for that nutty cheesy goodness! Wonderful for snacking, parties, and picnic treat. Enjoy! Want a Milkshake That's Good for You?